It’s not every year we get to see members of the three species of ‘black’ or Branta geese in Assynt but 13th October 2017 completed the trio for us. 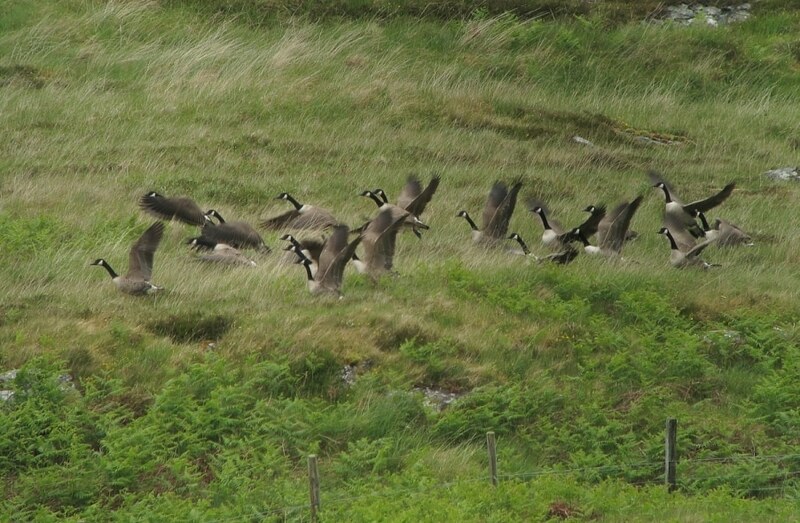 The possibility of seeing all three started on 11th June when around 34 Canada Geese Branta canadensis flew in and landed on the grazing at the west side of Clashnessie Bay. Canada geese, which are native to North America, are an introduced species in this country but the increase in the population has been spectacular. The Bird Atlas 2007-11 records a 162% increase in breeding range since the 1968-72 Breeding Atlas. This is causing some concern as this species is very aggressive towards, and it may be hybridising with, other species. In addition the large, widespread population may lead to water eutrophication and agricultural damage. Next to be added to the list was the Barnacle Goose Branta leucopsis. A small skein of 21 birds flew west from the direction of Oldany Island towards Rubh’an Dunain on 13th October. 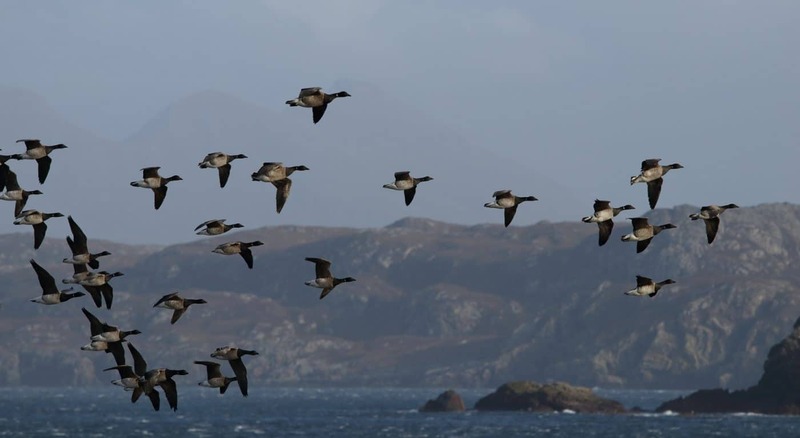 Oldany Island and Eilean Chrona are common locations to spot this migratory species during the winter. There are two main breeding populations which migrate to Britain and Ireland; those from Svalbard tend to spend the winter on the Solway Firth and the east coast of Britain. The birds from the Greenland population tend to be those we see here and they winter from the northwest of Scotland to western Ireland. 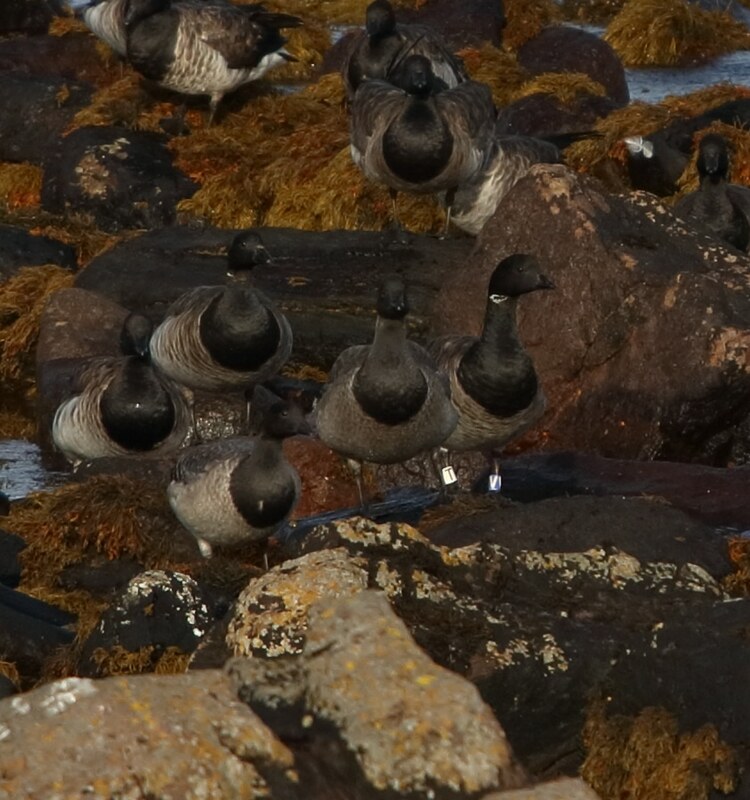 Finally, and also on 13th October, we got our trio when 37 light-bellied Brent Geese Branta bernicla hrota were spotted amongst the rocks to the north of the Bay of Culkein. However our fun was not over as we noticed one bird with colour rings on its legs. That means someone is studying this bird and the group it is part of. Because of the wind and rain we did not have our scope with us so could not read the letter on each ring with our binoculars. However, thanks to digital photography (and image stabilisation! ), we managed to get several photos of this bird and were able to read the letters once home. The details of the sighting were reported to Graham McElwaine of the Irish Brent Goose Research Group. He replied to say he was en route to Gatwick airport for a two week holiday in Costa Rica and would get back in touch on his return. Why the Irish Group? 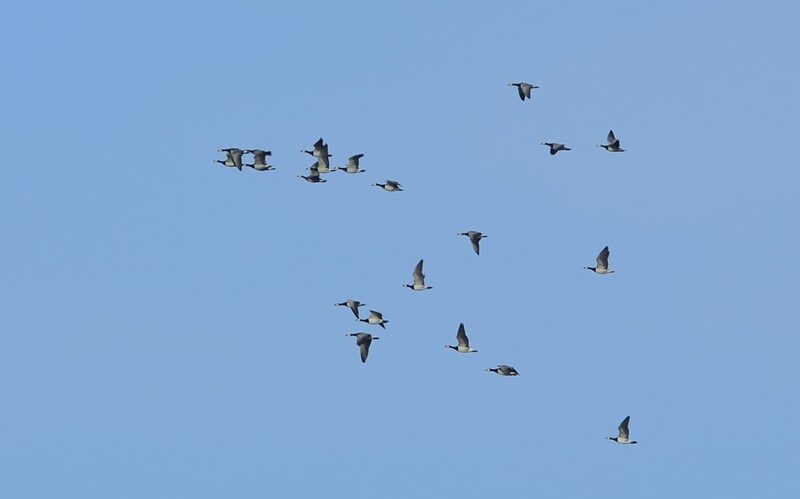 This was a ‘light-bellied’ bird, there being light and dark bellied populations together with what are known as ‘Black Brants’, and these different populations stick to their own wintering areas with the light-bellied birds we see being from the population that breed in Arctic Canada. They reach here via Greenland and Iceland and the vast majority of them spend the bulk of the winter in Ireland. Graham was true to his word and has now sent us the sighting history of ‘our’ bird. This male goose was ringed at Castlemaine Harbour, Co. Kerry on 26th March 2009 as a juvenile bird i.e. he was just coming through his first winter having fledged in 2008; he was spotted several times in the same location until 30th March. The next record has him at Blautós western Iceland on 15th May 2009 and then at Snæfellsnes again western Iceland on 21st May 2009. He is next recorded on 26th February 2010 back at Castlemaine and on 1st April 2010 he is seen with an ‘unringed associate’ – his mate? All records of him through until 5th November 2014 are from either Castlemaine or Strangford Lough. During that period however he was recorded on 13th October 2011 as being with ‘unringed mate and three juveniles’. By that point he will have made seven journeys between Ireland and his, as yet, unknown breeding site in Arctic Canada. May 23rd 2016 sees him at Myrar, western Iceland with an ‘unringed mate and 1 juvenile’ and all subsequent 2016 records are from Ireland. Then he turns up at Bay of Culkein, probably with his ‘unringed mate’ and maybe his 2017 juveniles. In the close photo of him he does have several juvenile birds around him – those with little or no white neck marking. We haven’t seen him again so the likelihood is that the group have now moved on to their wintering area in Ireland. Doesn’t stop us looking! Bird Atlas 2007-11………….Balmer, D.E., Gillings, S., Caffrey, B.J., Swan, R.L., Downie, I.S. & Fuller, R.J. 2013. Bird Atlas 2007-11: the breeding and wintering birds of Britain and Ireland. BTO Books, Thetford. 1968-72 Breeding Atlas….Sharrock, J.T.R. 1976. The Atlas of Breeding Birds in Britain and Ireland. T. & A.D. Poyser, Berkhamsted.